Five Mile Prairie is a small mesa that is located approximately five miles from the Downtown Spokane area. As one of the Spokane, Washington's newest residential areas, Five Mile Prairie Real Estate features some of the most coveted properties near the Spokane River. Because the area is situated 500 feet higher than the Spokane area, the homes within the area offer breathtaking mountain and prairie views. Major thoroughfares near Five Mile Prairie Homes include North 5 Mile Road, West Indian Trail Road, West Strong Road and North Country Homes Boulevard. Nearby areas include Balboa, Town and Country, Northwest Spokane and Northtown. Five Mile Prairie real estate holds an average listing price between $197,000 and $254,000. However, higher end single family home listings within the area range from $353,000 to $649,000. Most homes within the area feature 4-bedroom and 5-bedroom floor plans, while there are still some one-of-a-kind 3-bedroom, 6-bedroom, and 7-bedroom homes available on the Heights. Five Mile Prairie Homes for Sale offer a plethora of amenities starting with hardwood floors throughout, stone fireplaces and completed full basements. Other amenities include spacious great rooms, plenty of yard space and patios and decks that offer spectacular views. Floor plans from 1,170 square feet to 6,600 square feet are provided by Five Mile Prairie Homes. Although the area is known as one of Spokane's luxury communities, Five Mile Prairie Homes for Sale are surrounded by large rural land, while the northern and western slopes are marked by heavily forested and untouched terrain. Currently, the area is a bedroom community that overlooks several business and shopping districts, including Wandermere, Indian Trail Road, North Division and Francis Avenue commerce area. 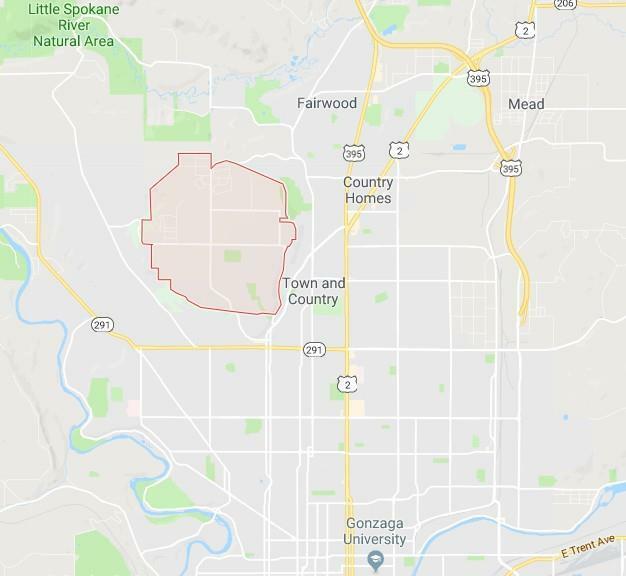 The nearest airport to Five Mile Prairie is Mead Flying Service Airport, while Spokane Felts Field is less than 8 miles away. The nearest post office is two miles on West Indian Trail Road, while the area not far from the outstanding Holy Family Hospital. Located on both sides of the Spokane River, Spokane Washington is home to big parks, interesting historical landmarks and a flourishing night life. As a consequence, Five Mile Prairie Real Estate is near some of the best activities and attractions within the Eastern borders of Washington. Without a doubt, residents attend lively festivals and concerts and enjoy the outdoor adventures at Riverside State Park, the beautiful Nine Mile Falls and the Centennial Trail. The ultimate access to hiking treks and rock climbing adventures is located less than 24 miles away at Mount Spokane State Park, while the Little Spokane River Natural Area is just minutes away from Five Mile Prairie Homes. Visitors and residents enjoy the Spokane Symphony, events at the Spokane Convention Center and the Martin Woldson Theater at the Fox and the beautiful Cathedral of Our Lady of Lourdes. The area is also home to nine golf courses that are less than 10 miles from the Heights, including the Downriver Golf Course, Esmeralda Golf Course and the Sun Dance Golf Course. Five Mile Prairie Homes for Sale are situated within the highly acclaimed Mead School District. The Mead School District provides more 53 elementary schools, more than 22 middle schools and nearly 20 high schools. The school district also provides an informative online parent-student-teacher connection system called PowerSchool Online. Schedule an Appointment or Ask us a Question. We Always Respond within 24 Hours.